This week in science we have been learning about solids and liquids. We got a board and some lemon juice, jam, washing up liquid, tomato sauce and some more liquids so we tested all of the liquids the jam fell in a lump! Over the last term we have been learning about changing places. We have done our Alice chapters and in science we have done solids and liquids. In maths we have done column addition and subtraction I really struggled getting the correct answer . This month we have decided to write our own stories, in the style of Alice in wonderland.We added our own Alice names and we also had our own setting, but it was still in the style of Alice in Wonderland. What we found under the ground!!!!! We found a box under the ground and we decided to open it and there was something to do with our topic Ancient Egypt there was a statue and lots of tiny models! and Crusha and lemon juice had less viscosity! Our trip to Coventry was exciting and fun. We learned about ‘The Blitz’ experience and Lady Godiva who rode the streets of Coventry. Yr4 then split up W4 travelled to the Transport Museum, but FC4 walked to The Herbert Art Gallery. On one bright sunny day , Rebecca opened one beady eye and stared out of the window, the stream was glittering blue and frogs were hopping around, fish were jumping out of the water . 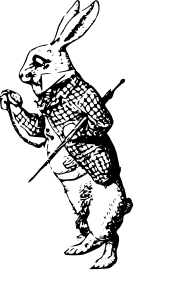 Rebecca saw a white rabbit wearing a handsome waistcoat and holding a pocket watch “I’m late I’m late” it was saying to himself. If you wish to read more it’s up on display in FC4 class.